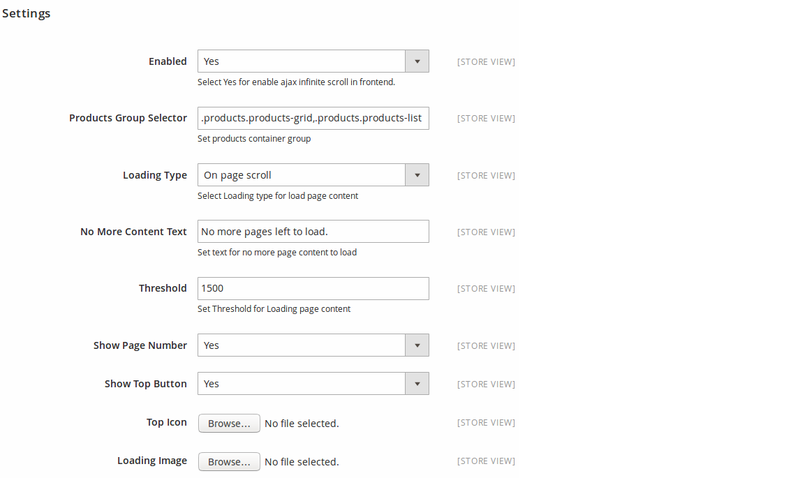 Provide field for add product group selector for apply ajax infinite scroll in custom theme. 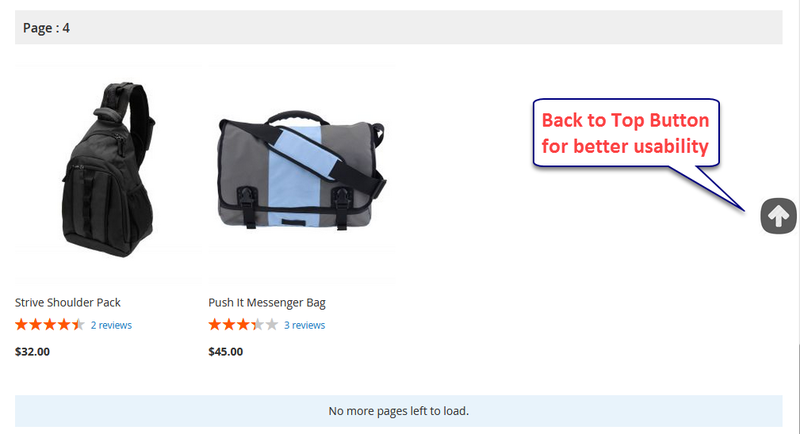 Provide options for choose product list loading type "On Button Click" and "Page Scroll". 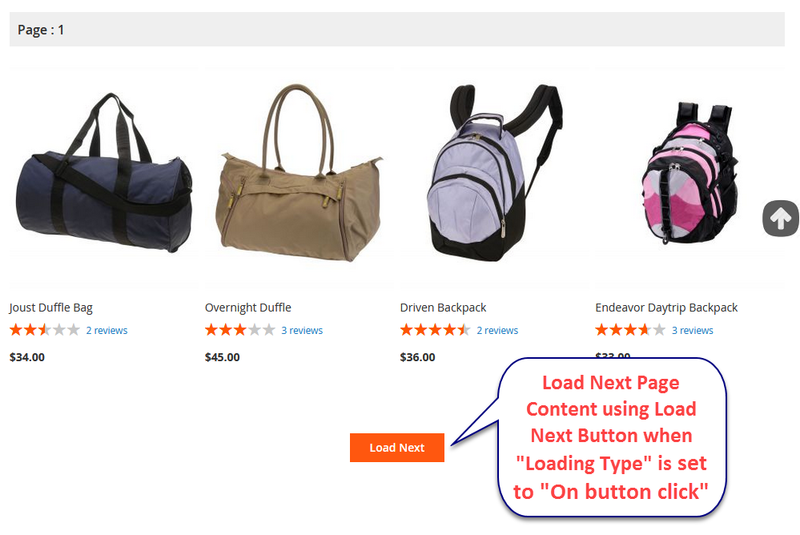 Provide facility to customize Load Next and Load Previous Button according to theme. Facility for upload image for display loading process. Facility for upload image for scroll top icon. Display message when no more pages left to load. 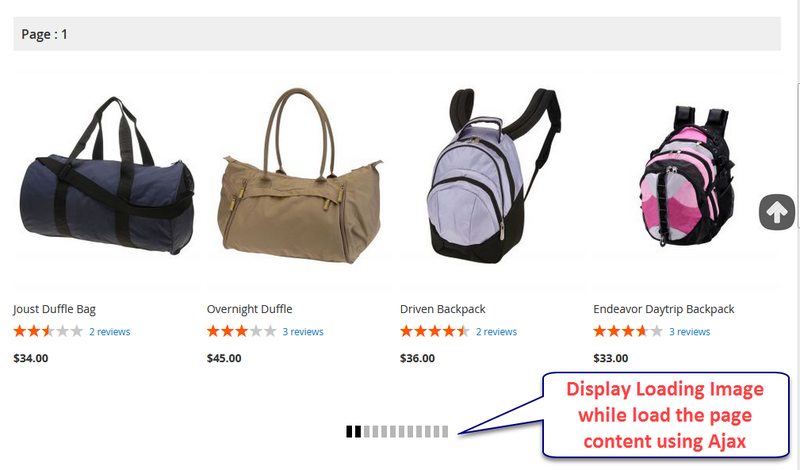 Using Magento 2 Infinite Scroll, you can load the product list infinitely by ajax scroll without interruption, It also provide facility to load next or previous page on button click of load next or previous button. Provide Back to Top button and lazy loading image. 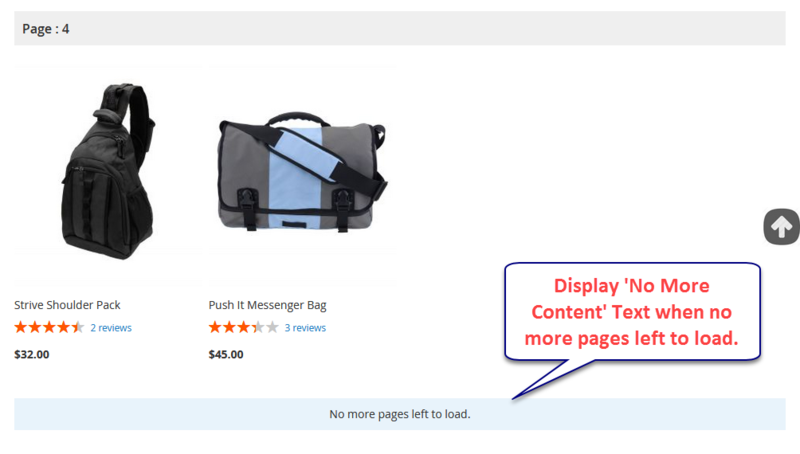 Display page number for corresponding page content and no more content text which will give message when no more pages left to load. With Ajax Infinite Scroll extension, products in next page will be loaded automatically with ajax when users scroll down to the end of page. 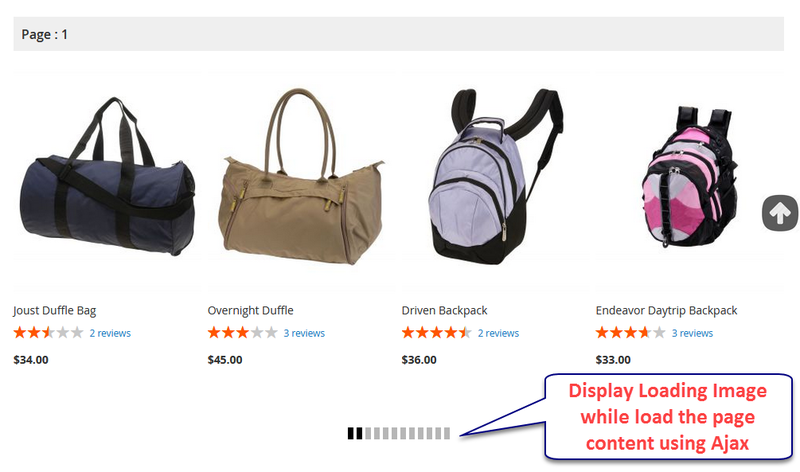 It makes shopping experience more enjoyable and easily. 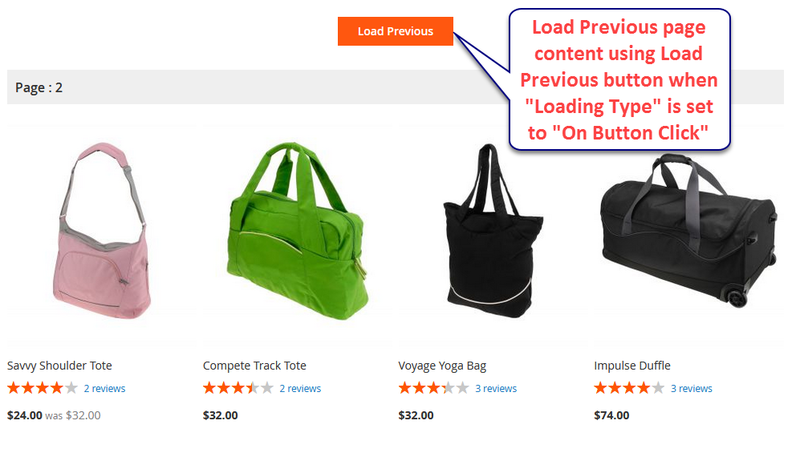 With loading type on Button click, you can control when the loading page content process starts, This will eliminate unwanted page loads. You can customize Load Next and Load Previous button as per your choice. 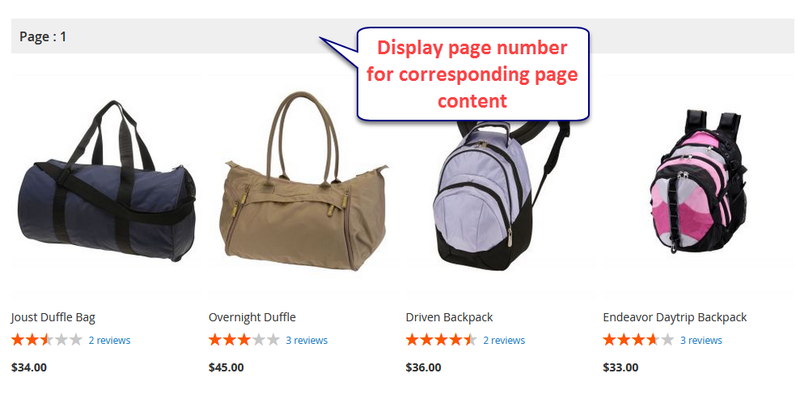 Provide facility to display page number for corresponding page content.When customer scroll to last page, The Message will be displayed for "No More Pages left to load".You can customize the message text. From any position of web page,you can easily get back to the top of the product list with back to top functionality.You can modify Back to Top Button Icon from configuration. You can customize product group selector for apply ajax scroll.you can set number of pixels before bottom of page that you want to start loading page on page scroll.Provide facility to select different loading type on page scroll or on button click. It is worth my $69 for Magento 2 Ajax Infinite Scroll than different modules. I have attempted another Infinite Scroll extension yet it is more costly and not great as its depicted, so I picked this extension. Work easily, have great support from MageBees. Generally, this is an extraordinary extension, can't remind any challenges while the installation or any conflicts with different extensions. I utilize the Ajax Infinite Scroll extension of yours. It's make my store better and I love it. Extension works as promised and customer service is off the chart!!! Precise documentation and examples! Genuinely recommend this! Great help for the loading products.I am exceptionally amazed about this speed of Infinite scroll. Very fast!! I am very impressed about this speed of Infinite scroll. Very quick! This extension improves speed of loading page significantly. Q-1: I have tried to install Ajax Infinite Scroll Pro extension using terminal, but I am not able to install using command line, what are steps for custom installation of Ajax Infinite Scroll Pro extension?? Q-2: I am getting error in console for magebeesInfiniteScroll.js not found ,How to solve this problem ?